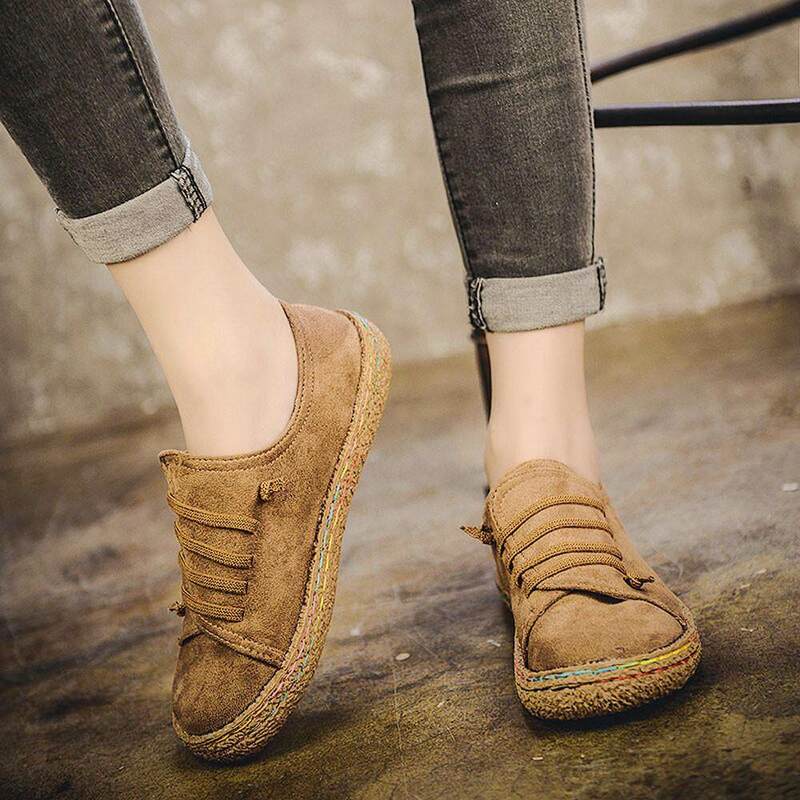 Women Ladies Soft Flat Ankle Single Shoes Female Suede Leather Lace-Up Boots Features: 1.High quality leather material,comfortable and soft,Reduces stress on joints,strengthens and tones,improves posture 2.Sandals casual shoes,full of elastic for Easy to wear Take off! 3.Personalized and breathable multifunctional sandals,We have more sizes Colour design for You and yours family or lover Or friends select 4.Lightweight walking shoe,Convenient slip-on design,Cushioned selectinsole,fashion and personality 5.Suitable for outdoor walking,Entertainment,leisure,party,work,Wedding and other occasions,color sturdy and stylish. Product information: Gender: Women,Girl Material:Artificial leather Sole Material:Rubber Function: Breathable,Lightweight,Soft Style: Fashion,Feminine charm Closure Type:Slip-On Heel Shape: Flat with Toe Shape: Round Toe Shoes Heel High: 1-3CM Appropriate Season: Spring,Autumn,Winter Occasion: Indoor&Outdoor,Fashion,Leisure Package: 1 Pair Women Shoes(Not including shoebox) NOTE: We suggest you to choose one zise bigger you want. As different computers display colors differently,the color of the actual item may vary slightly from the above images. Women Size Chart(Unit:cm/inch) US:5.5 UK:4.5 EU:34 CN:35 Foot Length:22-22.5cm/8.7-8.9″ Foot wide:8.5″ US:6 UK:5 EU:35 CN:36 Foot Length:22.5-23cm/8.9-9.1″ Foot wide:8.5-9cm/3.3-3.5″ US:6.5 UK:5.5 EU:36 CN:37 Foot Length:23-23.5cm/9.1-9.3″ Foot wide:9cm/3.5″ US:7 UK:6 EU:37 CN:38 Foot Length:23.5-24cm/9.3-9.5″ Foot wide:9-9.5cm/3.5-3.7″ US:7.5 UK:6.5 EU:38 CN:39 Foot Length:24-24.5cm/9.5-9.7″ Foot wide:9.5cm/3.7″ US:8 UK:7 EU:39 CN:40 Foot Length:24.5-25cm/9.7-9.9″ Foot wide:9.5-10cm/3.7-3.9″ Note: -Please allow 1-2cm measuring deviation due to manual measurement. – Please check the Size Chart before order. If you are not sure the size, please send message to us.